Your Calendar of Events for the month of July, please feel free to join us and it’s not too late to register for Vacation Bible School which is July 30-August 3. The Global Ministries Caribbean Initiative invites the whole church to witness together with the Caribbean region through education, advocacy, and support of our partners. Partner churches and organizations in Cuba, Haiti, the Dominican Republic, Jamaica, Puerto Rico, Venezuela, and Colombia, bring incredible gifts in their strong testimonies, as they receive and share the Good News of Jesus Christ. They provide us with a broader understanding of the many ways in which God is seen at work in the world and challenge us to expand our vision of the Church. Global Ministry’s hope and prayer is that through many and varied experiences, we will better understand the issues, priorities, successes, and struggles of sisters and brothers in the Caribbean and, in turn, be challenged to understand ourselves, our world, and our faith anew. During this initiative, members of the Christian Church (Disciples of Christ) and the United Church of Christ celebrate relationships with the Caribbean through a variety of resources for our congregation including Bible studies, music, liturgical materials, special giving opportunities, People-to-People Pilgrimages, videos, children´s resources, and more. Additionally, there are tools to address some of the universal challenges of the region: migration and human trafficking; the quest for peace; sustainable development in the face of climate change; and the churches’ witness for just economic policies that encourage the flourishing of life. Join the Global Ministries Caribbean Initiative today and Embrace the Fruits of the Spirit! At St. John’s United Church of Christ we will be utilizing the VBS curriculum “Embrace the Fruits of the Spirit”. It is a children’s curriculum designed to help children discover the fruits of the spirit in their daily lives while exploring the Caribbean. We meet the children of Cuba, Haiti, Jamaica, the Dominican Republic, and Colombia. How do the children of these countries live out their values in their daily lives? Each day’s lesson contains a letter from a child in that country, a story from the Bible that demonstrates a fruit of the spirit, a craft, a game, a snack, and a song. You can register online here. The United Church of Christ kicked off Pride month on Saturday, June 2, with a visible presence in the event held in denomination’s home city of Cleveland. The National Setting of the United Church of Christ, which served as the Education and Advocacy sponsor of the 2018 Pride in the CLE, joined in the parade and festival that followed with a number of UCC congregations and the Open and Affirming Coalition. “We’re excited to have this opportunity to join local UCC churches in support of the LGBT community and the sharing God’s love with our neighbors,” said Nichole Collins, Associate Director, Annual Giving and 3 Great Loves Project Manager in the Office of Philanthropy, Technology, Identity and Communication (OPTIC). 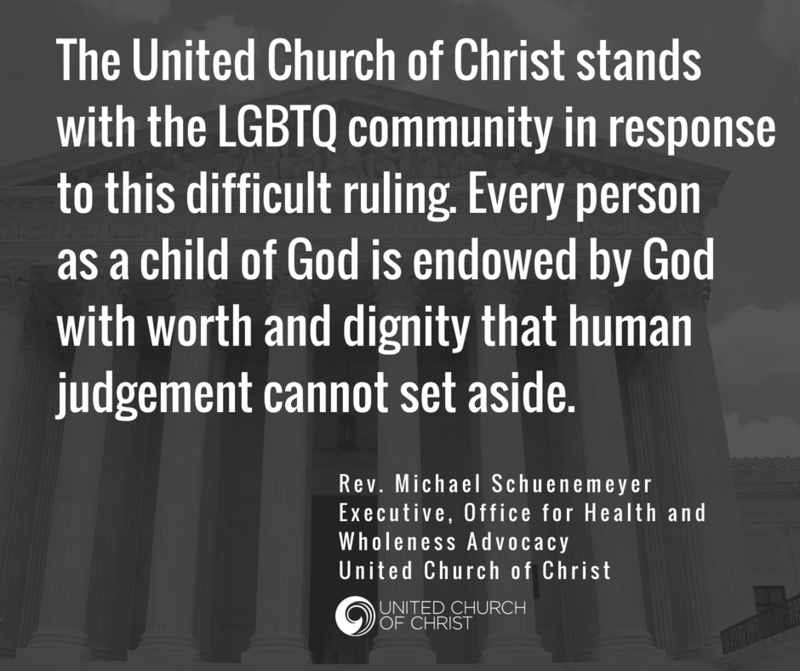 “The United Church of Christ stands with the LGBTQ community in response to this difficult ruling. 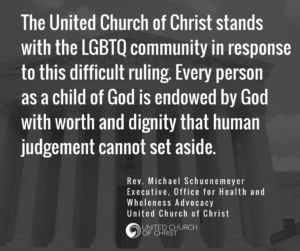 The General Synod of the United Church Christ has been unequivocal in it’s stand against discrimination based on sexual orientation or gender identity,” Schuenemeyer said. 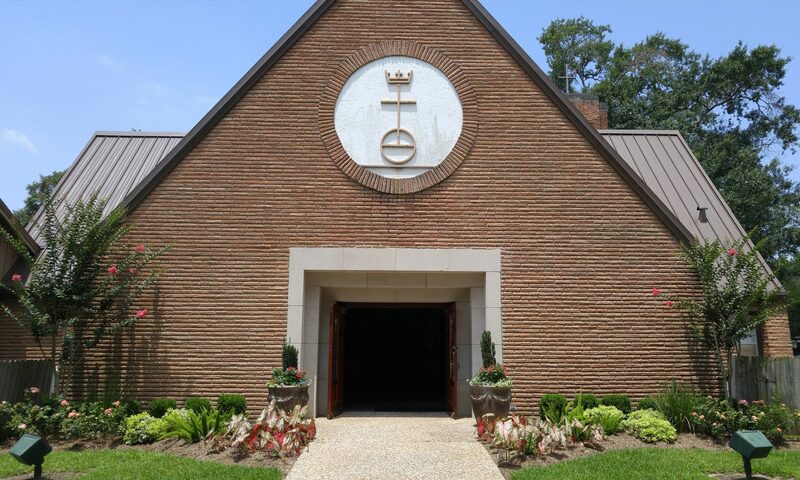 “The General Synod’s 1975 Pronouncement on Civil Rights affirmed that every person as a child of God is endowed by God with worth and dignity that human judgment cannot set aside. It recognized the harm that discrimination does in public accommodations. The General Synod has consistently called for legislation and policies that protect all children of God. The fruits of the spirit are not actual fruit. They are characteristics or qualities that people need to work on to become good people and good followers of Jesus. Nine fruits of the spirit are named in a letter that one of the disciples wrote. He wanted to help new Christians become good followers of Jesus. (Galatians 5: 22-25) During VBS week we will focus on five of them: love, joy, peace, generosity, and faithfulness. 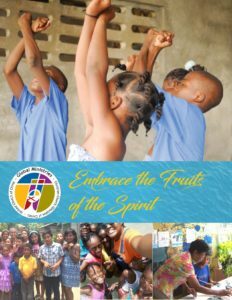 Embrace the Fruits of the Spirit is a children’s curriculum designed to help children discover the fruits of the spirit in their daily lives while exploring the Caribbean. We meet the children of Cuba, Haiti, Jamaica, the Dominican Republic, and Colombia. How do the children of these countries live out their values in their daily lives? Each day’s lesson contains a letter from a child in that country, a story from the Bible that demonstrates a fruit of the spirit, a craft, a game, a snack, and a song. I give permission for St. John’s UCC to use photos of my children for church media. Any diet instructions / food allergies / health concerns? Come be on mission in your own backyard! That is what Attack Poverty is all about. They are a global organization that serves locally, adopting pockets of poverty and launching what they call ‘Friends Communities’. These communities are long-term commitments that require mutual relationships and collaborative efforts with local organizations, churches, residents, and stakeholders committed to community transformation. June 11-14, 6:00pm-8:00pm, Friends of North Rosenberg will have a week long opportunity for you and your family, friends, and neighbors to serve alongside each other. There are many ways to participate or volunteer! Volunteer spots are limited, so choose your favorite when you register! To see a description of each area you can serve, click here. All students ages 11 and older may volunteer. If you have children ages 4-10 they can be a part of the Kids Camp! Join Friends of North Rosenberg in being the Hands and Feet of Jesus Christ right here in our own city! They’ve changed things up this year, and there is no required cost to volunteer! However, because this Mission Week will include over 50 volunteers and over 75 children and teens, they recommend a $20 per person or $50 per family donation to help cover costs. Feel free to give more or less as you feel led. To donate, click here. 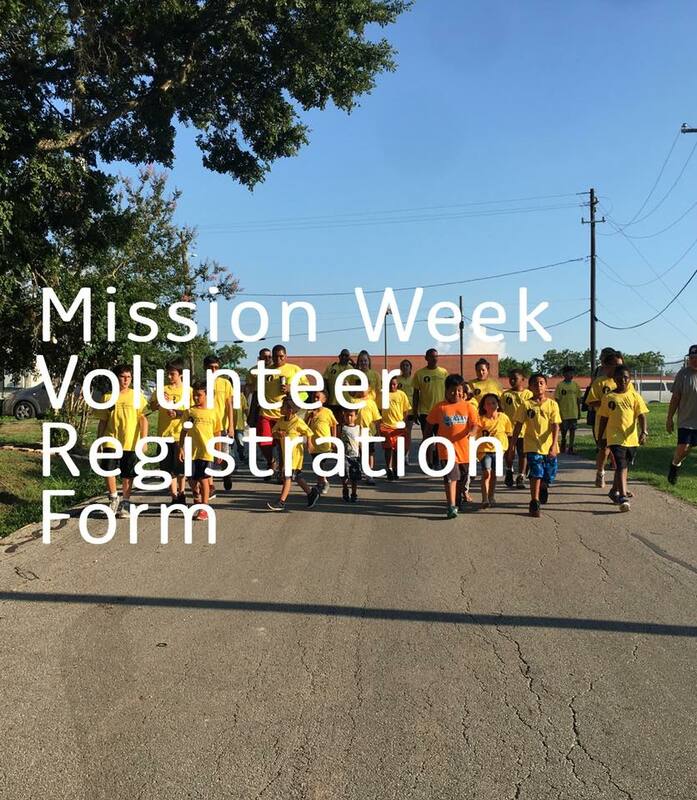 Orientation for registered local mission volunteers is June 7th 6 p.m. 503 3rd St, Rosenberg, TX 77471 (FNRO Resource Center). For any questions, contact Faith Guerrero at: faith@attackpoverty.org.